To get to Foxwoods we head south on RT 34 from Derby, but ran into some heavy duty rush hour traffic. So we exited and drove some back roads and jumped on I95 heading east. When you get near New London. Interstate 395 and Interstate 95 splits, and you have to stay in the left lane to get on Interstate 395 to go to Foxwoods. The short 7 mile drive from Interstate 395 is very scenic, with several small towns. Once you're in the general direction of Foxwoods, it's not hard to find at all. Just follow all the other cars and buses heading to Foxwoods. It didn't take long to spot Foxwoods. Here's the first sighting of that unique structure sitting out in the foothills. It does sort of stand out. I mean, there is really nothing else around for miles. But this one picture does not do it justice. As you can see in the picture below, the whole building is intricately detailed. From New York City: Take I-95 North to Exit 92 in Connecticut. Turn left onto Route 2 West. 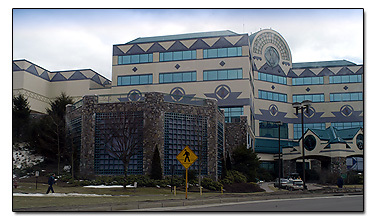 Foxwoods is eight miles west on Route 2. Drive time: 2 hours 30 minutes. From Boston: Take I-95 South to Exit 92 in Connecticut. Go straight at the stoplight. At the next stoplight, turn right onto Route 2 West. 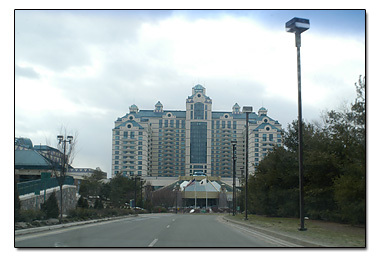 Foxwoods is eight miles west on Route 2. Drive time: 1 hour 45 minutes. From Hartford: Take I-84 East to Exit 55 - Route 2 East. You will find the resort nine miles past Norwich. Drive time: 50 minutes. From Providence Directions: Take I-95 South to Exit 92 in Connecticut. Go straight at the stoplight. At the next stoplight, turn right onto Route 2 West. Foxwoods is eight miles west on Route 2. Drive time: 45 minutes.